Braunton 10… Pre… | Contemplating my Navel! Last year the day started with squad swim, then a pedal over to the race and then the 10 miler. This year… no swimming! Don’t think the energy levels are there yet! Parkrun was a relaxed affair yesterday in 22.18 and that would be a nice pace today. Heading for 4.30’s I hope to finish around 1.12… which won’t be a bad effort as I’m feeling a bit cold / chesty. There was lots of activity yesterday! Not good for a time at a race but great family stuff. Jo is doing the couch to 5k and doing very nicely. Even buying training kit! 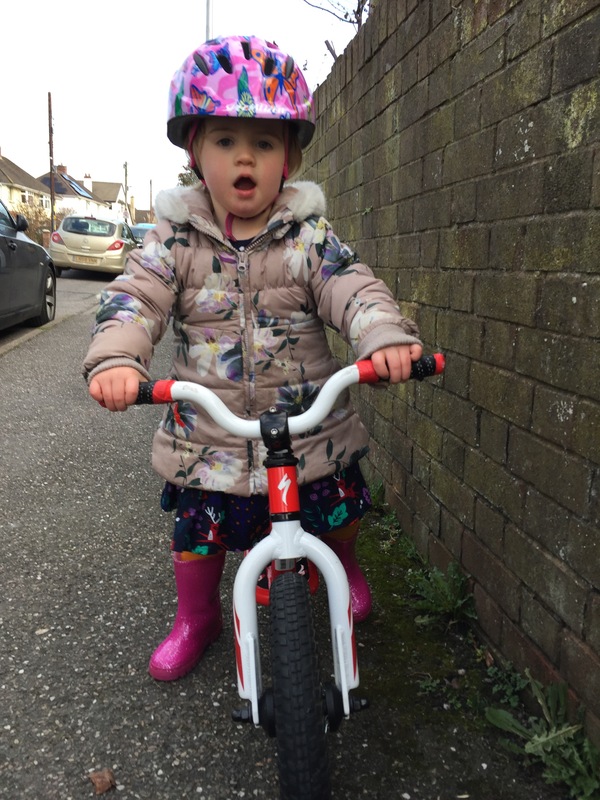 Emmie fits the balance bike and is building her leg strength. Not a great time of year for it but she’s keen. Once she has her balance and knows what she’s doing she’ll be great. No fear!